Change has become a constant in an ever complex environment. 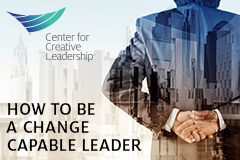 Learn from experiences from top leaders worldwide through their life lessons in leading, navigating, and executing change initiatives. In this whitepaper “Change-Capable Leadership: The Real Power Propelling Successful Change”, we see real leaders share real stories on the realities of change. They examine what was done and lacking. They reflect on their behaviours, actions, mindsets and challenges, giving us a deeper view on both their successes and failures. Change is never linear - always continuous, numerous and simultaneous. Going beyond change-management models, this research considers both change processes and the people behind the change - to learn from them what helps, what warning signs to look out for, what causes derailment and why mindset and intentions matter. Nine Key Competencies: What supports positive change?